The protest against poor air quality in Delhi was organised by several citizens' groups. 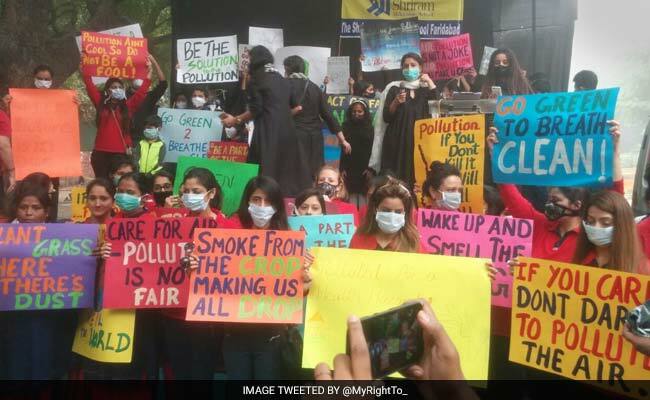 New Delhi: Hundreds of people, including children on Sunday staged a protest at Jantar Mantar over the deteriorating air quality in the national capital, demanding the government to take effective initiatives to curb the rising air pollution. The protest, organised by various citizen's group of Delhi, was also joined by celebrities such as Nafisa Ali among others. "To curb the pollution, Delhi Government's Odd-Even initiative was a huge success. If possible, it should be implemented once again," actress Nafisa Ali said. Another protester said: "Delhi has already become a gas chamber... how will people breathe in such pollution." Delhi on Saturday witnessed the highest pollution levels of the seasons. The smog that hung low over the city kept pollution levels extremely high, breaching the safe limit by over 17 times at several places. An emergency cabinet meeting has also been called at the Chief Minister Arvind Kejriwal's residence in the afternoon. The meeting is likely to take place at 12:30 pm and will be attended by all the cabinet ministers and the senior officials of health and the environment department.